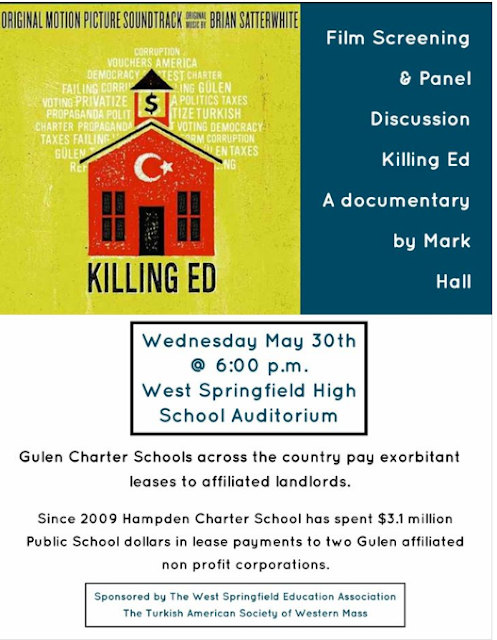 WEST SPRINGFIELD -- The issue of charter schools with possible ties to a controversial Muslim cleric will be explored during a panel discussion and screening of the film "Killing Ed" at 6 p.m. Wednesday at West Springfield High School, 425 Piper Road. The issue is of particular concern to Mayor Will Reichelt, school Superintendent Michael J. Richard, and local state lawmakers, all of whom have raised concerns about the publicly financed charter school that's set to open in West Springfield in the fall. The Hampden Charter School of Science in Chicopee is expanding to West Side, where HCSS-West is scheduled to open in September at the former Immaculate Conception-St. Frances Xavier Cabrini property on Main Street in the city's Merrick neighborhood. The new charter school is modeled after its successful Chicopee flagship, which will now be known as HCSS-East, and is expected to draw up to 588 students in grades 6-12 from West Springfield, Agawam, Holyoke and Westfield. But critics worry it will siphon students and funding from the city's eight public schools. Besides the financial impact of a competitor taking a bite of the public education apple, Reichelt and others are concerned about the political impact of HCSS-West opening in town. The school's Chicopee forerunner has business ties to organizations that have been linked to Fethullah Gulen, a self-exiled Turkish imam who lives in Pennsylvania's Pocono Mountains. Gulen is the inspiration for a growing international charter school movement that's already well-entrenched in the U.S., particularly in Texas. There's nothing wrong with that at face value, particularly since Gulen is viewed by U.S. officials as a "moderate Muslim" who preaches peace throughout the Islamic world. But here's the downside: His followers have been labeled terrorists by the Republic of Turkey, a U.S. ally, which blames the so-called Gulen movement for a 2016 coup attempt. Investigations into how Gulen-inspired charter schools spend their public dollars is also a concern for some public officials, including Sen. Jim Welch and Rep. Mike Finn, a pair of state lawmakers from West Springfield. The officials have called for an audit of HCSS and question the process the Massachusetts Department of Elementary & Secondary Education used when permitting the charter school to open in West Springfield. With state lawmakers calling for an audit of a charter school slated to open in West Springfield, city officials are organizing a panel discussion about a charter school network associated with Fethullah Gülen, a controversial Turkish imam behind a growing social, political and educational movement in the U.S. and Turkey. State officials initially approved a site in Westfield for the new charter school, but after that location fell through they allowed the school to switch sites to 475-485 Main St. in West Springfield. No public hearings were held in West Side, according to Welch and Finn, who believe state officials had made up their minds about the site transfer before visiting the former Catholic church compound in Merrick. "The process by which this decision was made did not take into account the voice of West Springfield's public school officials, parents or teachers, the majority of whom opposed this move," Welch and Finn wrote in an April letter to Gov. Charlie Baker, asking him to intervene. During deliberations over whether to approve HCSS-West, Massachusetts Board of Elementary & Secondary Education members raised concerns about Gulen allegations, but the board still voted to OK the new charter school. Acting Massachusetts Education Commissioner Jeff Wulfson said the Education Department found no evidence to support allegations of "ambiguous financial practices" by Hampden Charter School of Science, according to February 2017 minutes of the state Board of Education. "The Commissioner noted that HCSS-West anticipates opening for the 2018-2019 school year and the school will be watched very closely between now and then. He said if the Department receives information about a nefarious situation involving the school, we would take action based on that evidence," the minutes say. In general, state officials say HCSS has an "outstanding track record" and stand by their decision to grant a charter to HCSS-West. Tarkan Topcuoglu, the school's CEO, has denied any ties between his school and charter schools or organizations connected to the controversial Muslim cleric. "We are an independent public school. We are not a religious school at all," Topcuoglu said. Dominic Slowey, a public relations specialist in Boston who represents the Massachusetts Charter Public School Association, took a swipe at Reichelt, West Side's mayor and perhaps the most vociferous critic of HCC-West coming to town. "We're not a terrorist organization or a cult, or whatever the mayor is insinuating," Slowey said in an email to The Republican. Sen. James T. Welch and Rep. Michael J. Finn, Democratic state lawmakers who represent West Springfield on Beacon Hill, are opposed to a charter school opening in West Side, raising concerns about the lack of public input before the plan was approved by the state. In addition to siphoning students and funding from city public schools, Reichelt believes there are too many unanswered questions about the Gulen movement to allow HCSS-West to open. "These kinds of allegations seem far-fetched," he said, "but the public record on this matter is deeply concerning." 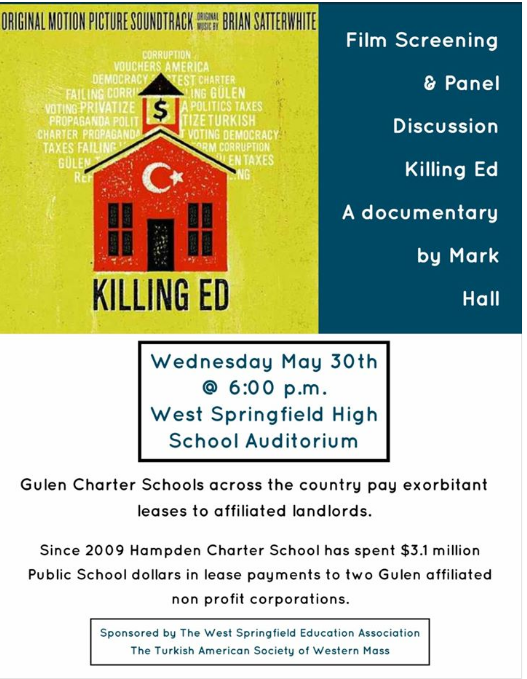 Wednesday evening's free event at West Springfield High School will feature a panel discussion with Mark S. Hall, the director of "Killing Ed," a film that examines the reach and expansion of Gulen-inspired charter schools in America. Other panelists include educators, members of the local Turkish community, state and local officials, and attorney John Martin, a partner with the international law firm hired by the Turkish government to investigate the Gulen movement. Massachusetts is currently home to three Gulen-affiliated schools, with critics saying HCSS-West will mark the fourth such school when it opens in September. The event is cosponsored by the West Springfield Education Association and the Turkish American Society of Western Massachusetts. "We're going to fight this until we can revoke this charter," said Bill Garvey, a member of the West Sprignfield School Committee involved in planning the discussion at the high school. Hall said the main message of his documentary, which focuses on the heavy concentration of Gulen charter schools in his native Texas, is that funding practices, pay and gender discrimination, and the use of special visas to bring Turkish teachers to the U.S. are issues that have been linked to Gulen-affiliated institutions across the country. Both the federal Department of Labor and FBI have investigated certain schools with ties to Gulen, including whether his followers have skimmed money from these schools to help fund his movement in Turkey. "I'd tell the people that this is an organization that you don't want operating any school," said Hall, noting that the issue doesn't split along partisan lines in the U.S., with lawmakers from both parties embracing Gulen as a moderate voice in the Islamic world. "I accept the challenge that we will work our tails off to make sure that we keep students in our school system and that we give them the best education possible," West Springfield Public Schools Superintendent Michael J. Richard said at Monday evening's School Committee meeting, after announcing that a new charter school is opening in West Side. "I think it's nonpartisan. A lot of politicians who are involved in this are from both sides of the aisle," he said. "It's really about money when it comes to the purchase of political influence." Gulen charter school backers are influence peddlers, according to Hall, whose film shows how the publicly funded, privately managed schools deftly navigate the corridors of power. "This film has struck a lot of nerves," said Hall, an attorney who financed and directed the movie himself. "These guys have really found a very comfortable place to do their work." Hall followed the Columbia Journalism School's rules for investigative journalists when filming the documentary, which was vetted by three different law firms and deemed "air tight," he said. "The commissioner will be making his decision on whether or not they can transfer that application from the Westfield location to the West Springfield location in the upcoming days, really," state Sen. Jim Welch, D-West Springfield, told the Town Council on Monday, March 19, 2018. "I'm a filmmaker," he said. "People can choose whether they believe it or don't believe it." Hall will introduce the film, which is scheduled to be shown at the start of Wednesday's program, followed by a panel discussion from 7:45-8:30 p.m.
"My hope is the screening will give us the momentum and assistance we need to move ahead," said Garvey, the school board member involved in bringing the event to West Side. "My ultimate goal is to have the expansion and original charter of HCSS revoked," Garvey said.